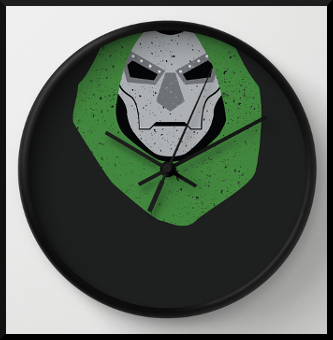 Keep track of time with the Doom clock. Two days after I posted my resignation, my company decided to institute a new policy. Well, to be completely accurate, it’s actually an update to a current policy — a little thing called Effort Reporting AKA Time Tracking. In case you’re not familiar with it, this is a mechanism wherein employees book hours against projects so that upper management knows where folks are spending their time. I’ve been doing this in some form or another for 10 years. Lucky me. Anyway, the standards were fairly loose and as a result I didn’t care much about it. Took 15 minutes a week to do. Blam! At any rate, the deal is that now everyone must log in daily to this application to record exactly where their time went, in 15-minute intervals. If you have an extended session in the bathroom, you’re going to have to get creative when figuring out where, exactly, to book that time. There is no option for producing toilet art. This past week, everyone on the team had official and mandatory training to get up to speed on exactly how we are supposed to perform this glorious task without errors. Mine was scheduled for April 2nd. I intentionally skipped it, of course, because: Not with the company anymore. Actual transcript other than identity-related changes. So yeah — my manager got an email saying I wasn’t there and he called me out on it. I told him: What’s the big deal? I’m not going to be here anymore, so how can attending this training possibly be necessary? He says: This is bad for me. That report went to the highest levels and now it looks like one of my team members is disengaged and uninterested. The thing is, I am disengaged and uninterested. I’m leaving, for Christ’s sake! If there’s one single time during your professional life where it’s okay to grab some nuts and shrug, shouldn’t this be it? But instead of seeing things in those simple terms — the conflict between myself and my soon-to-be-ex-manager — my improved quit-vision provides additional insight into what’s going on here. The effort reporting is a control mechanism. An additional way to evaluate people using quarter-of-an-hour blocks of time. Another way to assert ownership of personnel, to put employees on edge. To get more out of them. It’s spun as a method to hold employees accountable. Don’t we all want to be held to the highest standards? Shouldn’t we desire to be the best we can be? This is clever, because when you phrase things this way, it’s difficult as a worker to say that this sounds pretty sucky. It appeals to your moral core, your sense of ideals, and you end up saying: I want to be held accountable. I’m a conscientious worker, and I do a good job. I have nothing to fear from this: Sure, I’ll tell you where my hours are going. But internally, the whole idea seems so utterly exhausting that I can’t help but feel very fortunate that my quit-date was just in advance of this suffocating process addition. So after my manager finishes telling me how disappointed he is that I didn’t attend the training, I just point blank tell him what I actually think: Well, I’m not disappointed at all. In fact, I’m pretty glad that I didn’t attend, and also that I won’t be doing this horrible thing in the future. So, so great. Really, it is. My honesty shocks him out of his management wonderland and he responds to me as a human being for once: he laughs. Then he adds that he wishes he didn’t have to do it either. It’s the one lighthearted moment we shared while having this otherwise awkward discussion. Part of the way it was ‘sold’ to her was: If we notice everybody is working more than normal, the company can more easily justify hiring additional personnel to handle the load. But everyone on her team has been consistently working overtime during those two years. Additional heads? Zero. So why do they really want this data? Again, I can only assume it comes down to putting more pressure on employees. To hold them “accountable.” Or possibly to see if people are consistently booking “under” 40 and are therefore maybe expendable. Or to cross-compare employees to see if some are able to multitask better than others. Or to have a more robust way to check if certain employees are taking more “doctor time” or “pick my kid up from school” early leaves than other people. Et cetera. I’d focus on the positives and that would help me sail through. If I wasn’t smiling exactly, at least I was lining my pockets. But now that I’m quitting forever, I find that I don’t want to be stoic about work anymore. I don’t want to suppress. Instead, I’m uncomfortably aware of the relentless industry trend to increasingly automate the micromanagement and monitoring of employee time. And I’m also aware of how powerless and afraid my manager is to have his own thoughts on the subject. He can’t admit for one second that he doesn’t agree with any of this (even though his awkward laugh indicated that he doesn’t like it any more than I do), or his job is at risk. The fact that I didn’t attend this absurd training ultimately makes him anxious and fearful; Someone above him in the chain might yell at him. Honest question: If he’s yelled at for fifteen minutes, how is he going to book that time? Crosstraining? Not accurate — he already knows what he’s supposed to be doing. Administration? Also not accurate — he’s not working on documentation or attending official meetings. In the end I decided they needed a new bucket in the effort reporting system labeled Utter_Bullshit. It will occupy about 15% of the average employee’s workweek.